You'll earn a Facewest Credit of £22.46 with this item. 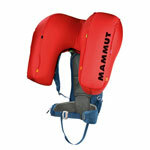 The Mammut Rocker Removable Airbag 15L is a close fitting pack that has enough space to carry vital avalanche safety equipment along with essentials for a day freeriding or boarding away from the crowds. At 15 litres there's enough space for your avalanche gear and day kit, plus external attachments allow for either skis or a board to be easily attached for hikes. This is a great choice for anyone that wants to venture that little bit further and still afford that essential avalanche protection. The 3.o Removable Airbag differs from the Protection Airbag in that it's more of a large pillow shape known as a 'wing' that doesn't inflate around the head, so it doesn't offer as much trauma protection. It's advantages are that it is lighter, cheaper and takes up a bit less space in the pack. It's also a little easier to remove and install in the pack than the Protection Airbag. For information on how avalanche airbags work in general and the differences between the brands, please read Avalanche Airbag Information. Lightweight yet featured pack for tours or freeride. 2.06kg.